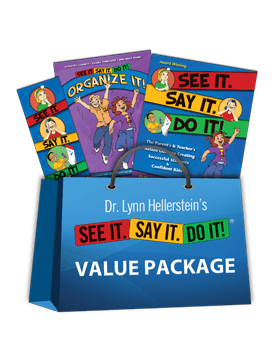 Includes Dr. Hellerstein’s two core books, plus a bookmark, to help parents, educators, and therapists help kids succeed at home and school. SEE IT. SAY IT. 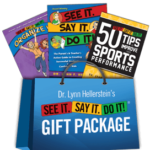 DO IT!® The Parent’s & Teacher’s Action Guide to Creating Successful Students & Confident Kids – Author and developmental optometrist Dr. Lynn F. Hellerstein shows how to use her action-based visualization process to improve children’s lives in this easy-to-read and delightfully illustrated book. The resulting transformation creates success and confidence in school, sports, work, and life. SEE IT. SAY IT. DO IT!® Organize It! Workbook – Author-therapists Beth I. Fishman-McCaffrey, Patricia Dunnigan, and Dr. Lynn F. Hellerstein present step-by-step strategies and organizational charts to help children organize daily routines and assume responsibility for activities. Tired of fighting the “homework battle” every night? There is a better way, and developing this skill is key to success in school, work, and life. SEE IT. SAY IT. DO IT!® Bookmark – A handy, colorful reference to the five signs of vision problems and strategies to create successful students. Be the first to review “SEE IT. SAY IT. DO IT!® Value Package” Click here to cancel reply.